Sphaerotholus is a genus of pachycephalosaurid dinosaur from the Upper Cretaceous of the western United States and Canada. To date, three species have been described: the type species, S. goodwini, from the Den-na-zin Member of the Kirtland Formation (Late Campanian) of San Juan County, New Mexico, USA; S. buchholtzae, from the Hell Creek Formation (Late Maastrichtian) of western Carter County, Montana, USA; and S. edmontonense, from the Horseshoe Canyon Formation of Alberta, Canada. The etymology of Sphaerotholus is a combination of the Greek sphaira, meaning "ball", and tholos, meaning "dome", and is a reference to the characteristically dome-shaped pachycephalosaurian skull. The survival of Sphaerotholus from the Campanian of New Mexico to the end of the Maastrichtian of Montana demonstrates that this taxon had both a relatively long duration (approximately 7-8 million years) and a widespread distribution. Williamson and Carr, who first described the genus in 2002, diagnose it as follows: "Differs from all other pachycephalosaurids where known in the possession of a parietosquamosal bar that decreases in depth laterally as seen in caudal view and is bordered by a single row of nodes and one lateroventral corner node." Sphaerotholus is considered a highly derived pachycephalosaur. The holotype of the type species (NMMNH P-27403, New Mexico Museum of Natural History) consists of an incomplete skull lacking the facial and palatal elements. The species is diagnosed as follows: "Sphaerotholus which in caudal view possesses a parietosquamosal bar that reduces in depth laterally to a lesser extent than in S. buchholtzae and the parietal is reduced to a thin slip between the squamosals." The species name honors paleontologist Mark Goodwin for his work with pachycephalosaurian dinosaurs. The holotype of S. buchholtzae (TMP 87.113.3) consists of an incomplete skull. The species was diagnosed as having a parietal that is widely exposed between the squamosals and wide enough to bear parietosquamosal nodes, a shallower caudal margin of the parietosquamosal shelf, the lateral corner node is reduced in size and located above the ventral margin of the parietosquamosal bar, and the nodes in the lateral margin of the parietosquamosal shelf reduced on the squamosal and coalescing into a ridge on the postorbital. The specific name honors Emily A. Buchholtz for her extensive work with pachycephalosaurians. Sullivan (2003) considered S. buchholtzae a junior synonym of Prenocephale edmontonensis (or Sphaerotholus edmontonense). However, Mallon et al. (2015), in their description of a new S. buchholtzae specimen from the Frenchman Formation of Saskatchewan, Canada, noted that S. edmontonense was distinct from buchholtzae based on comparative morphology and morphometrics. A Troodon edmontonensis was described by Brown and Schlaikjer in 1943 on the basis of three domes from the Horseshoe Canyon Formation of Alberta. Williamson and Carr  considered the species to be invalid, but in 2010 Nicholas Longrich e.a. 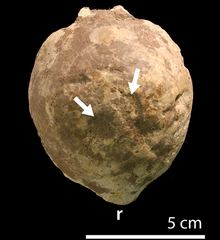 named a Sphaerotholus edmontonense that could be distinguished from S. goodwini by the paired hornlets on the back of the dome, and from S. buchholtzae by the elongate parietals. ^ a b c d Carr T. E.; Williamson T. D. (2002). "A new genus of highly derived pachycephalosaurian from western North America". Journal of Vertebrate Paleontology. 22 (4): 779–801. doi:10.1671/0272-4634(2002)022[0779:angodp]2.0.co;2. ^ Robert M. Sullivan (2003). "Revision of the dinosaur Stegoceras Lambe (Ornithischia, Pachycephalosauridae)". Journal of Vertebrate Paleontology. 23 (1): 181–207. doi:10.1671/0272-4634(2003)23[181:rotdsl]2.0.co;2. ^ Mallon Jordan C.; Evans David C.; Tokaryk Tim T.; Currie Margaret L. "First pachycephalosaurid (Dinosauria: Ornithischia) from the Frenchman Formation (upper Maastrichtian) of Saskatchewan, Canada". Cretaceous Research. 56: 426–431. doi:10.1016/j.cretres.2015.06.005. ^ Brown B.; Schlaikjer E. M. (1943). "A study of the troödont dinosaurs with a description of a new genus and four new species". Bulletin of the American Museum of Natural History. 82 (5): 115–149. ^ Longrich N. R.; Sankey J. T.; et al. (2010). "Texacephale langstoni, a new genus of pachycephalosaurid (Dinosauria: Ornithischia) from the upper Campanian Aguja Formation, southern Texas, USA". Cretaceous Research. 31: 274–284. doi:10.1016/j.cretres.2009.12.002. Williamson T. D.; Carr T. E. (2002). "A new genus of highly derived pachycephalosaurian from western North America". Journal of Vertebrate Paleontology. 22 (4): 779–801. doi:10.1671/0272-4634(2002)022[0779:angodp]2.0.co;2.